I read this article and found it very interesting, thought it might be something for you. The article is called The Lights and Lessons of Toro Nagashi, the Japanese Candle Boat Ceremony and is located at http://modernloss.com/what-a-japanese-candle-boat-ceremony-taught-me-about-death-and-life/. My daughter and I left the circle of teachers, students and parents sitting in meditative Quaker silence around the campfire. A teacher had indicated it was our turn to walk down the rocky path to receive our candle boat. Although the nearly full moon had risen, its light barely penetrated the trees. Neither of us had taken along flashlights since we had walked up the path to the campfire just before sunset, when it was still light enough to navigate the numerous rocks jutting from the dirt. I had thought that on our return, we’d be sure to find someone with a flashlight to walk with, but now we were being released two by two, parent and child. We would have to walk the path together in the darkness. As I wondered how we’d make it downhill without falling over our feet or breaking the silence to ask for help, a dim light appeared from behind. I turned back to see who was there, but it was pitch black and I could not make out our helper’s face. With that light, however weak, I could see enough of the ground to pick my way among the rocks. It would be the first of several moments on my daughter’s 7th-grade retreat, a time meant to build community between students, parents, and teachers, that would teach me how important it is to keep an open mind and to allow events to unfold in unexpected ways. At the hill’s bottom, we continued the silence begun at the campfire. 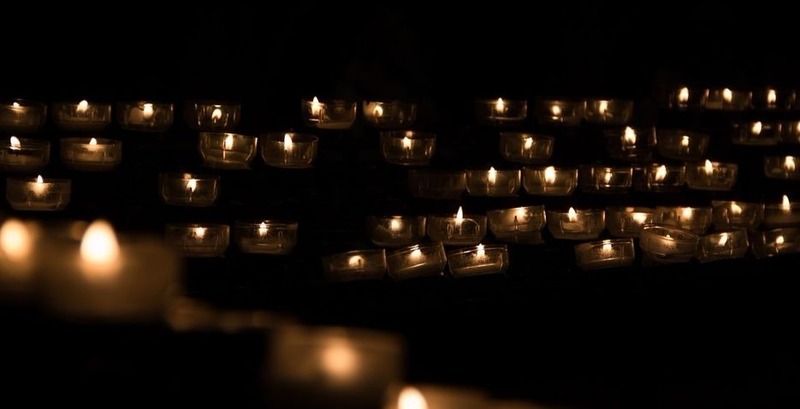 I followed my daughter to the picnic table filled with candle boats — tea lights settled into clear plastic cups — and a classmate handed her one. The previous week, my Japanese neighbor had died. He lived across the street from my childhood home, and I had known him since I was born. Jack was old enough to be my grandfather. When I was 4, I’d offer to help him wash his car; he loved to remind me of this story. Before I took my first international trip, he and his wife had me over for a home-cooked Japanese meal. They made the trip to Florida to attend my wedding. After Jack’s wife died, he spent a Thanksgiving with us. Jack’s funeral was scheduled for the same time that I was to attend my daughter Olive’s retreat — her first at her new school. I struggled with the decision to miss the funeral, but I decided it was too important to spend this time with my daughter. In a twist of fate, the candle boat ceremony that Olive and I participated in during the retreat was a Japanese tradition called Toro Nagashi. In Japan, the candle boats illuminate a path for souls to find the spirit world. Later, after the ceremony had finished, I was curious to learn more and found that the Festival of Recovery had started in 1946 when, according to one description, “much of Japan was still in ruins.” The “ruins” referred to the aftermath of war, but I wondered who doesn’t feel in ruins after death takes a cherished person? At the pond’s edge, my daughter knelt down to release the candle boat into the water. We stood on the grassy bank, and I shivered in the cold air. The silence continued. At the time, I didn’t know the ceremony was originally created to honor the dead. Yet I found myself dedicating my part of the shared candle boat to my neighbor Jack’s memory. Four other boats already floated toward the pond’s center. More students and their parents arrived and soon there were 33 boats illuminating the water. A teacher broke the silence to say one light was beautiful, but multiple lights were even more beautiful. If I’d been at the funeral, rather than at the boat ceremony, Olive would have been paired with a teacher or parent she didn’t know well. And I’d never have experienced the wonder of engaging in the coincidental Japanese ceremony to honor my Japanese friend’s memory. As I listened to a teacher speak, I was reminded that our lives are deeply impacted by how we affect others. I’d spent time with Jack and appreciated him while he was alive. And now I was doing the same for Olive. Deborah Ager is an author, founder of a magazine, and a terrible yogi. She co-edited The “Bloomsbury Anthology of Contemporary Jewish American Poetry” (2013) and “Old Flame: Ten Years of 32 Poems Magazine” (2012). Her writing has appeared in Tablet, Kveller, The Rumpus, The Birmingham Poetry Review and in the works of her ghostwriting clients. She’s received fellowships from the MacDowell Colony, the Mid Atlantic Arts Foundation, Virginia Center for the Creative Arts, and the Maryland State Arts Council. She lives in Maryland with a man, child, and cat, and can be found radiantmedialabs.com and deborahager.com.